I admire the inclusive mission of the station and its commitment to consistently high standards. This translates to dedicated volunteers and wise management. I appreciate the freedom that broadcasters are given to fashion their own programs and explore their own interests. There's a nice camaraderie among the classical broadcasters even though we have different tastes and styles. WWUH has a world-class library of classical recordings. I'm like a kid in a candy store when I'm browsing the CD stacks. Although I enjoy the music programs, I particularly depend on WWUH's Public Affairs programming to learn what my country is really up to. I listen without fail, weekdays 12-1. All the usual suspects, of course, from the Renaissance to our times. I have a particular interest in Twentieth Century British composers and in the non-dodecaphonic giants of the Twentieth Century: Hindemith, Bartok, Nielsen, Janacek, Shostakovich, Martinu. I revel in the wonderful early-music recordings now available and continue to be amazed at the quantity and quality of great compositions from all eras being rediscovered in our time. 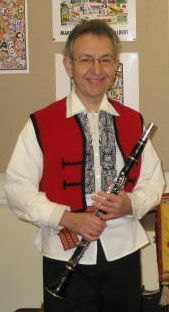 I enjoy several kinds of folkdancing and spend a lot of time in Balkan folkdance music transcription, practice, and performance (clarinet, oboe, recorder, bass, guitar, vocal). For many years I studied and played South Indian Classical music. I also love walking, swimming, birdwatching, gardening, yoga. And yes, I follow the Red Sox. One of my life problems is that I've never been able to decide what I wanted to be when I grew up! I'm over 65 now, and I still can't decide. There are too many possibilities and not enough time. While attempting to decide, I've worked as a music teacher, yoga teacher, elementary school teacher, and computer programmer. My mother was a good pianist and choral singer and my father loved to sing folk songs. My parents took me to classical concerts when they were free and nearby, but I mostly slept through them. It was a favorite uncle and aunt and their son who really kindled my love of classical music when I was around eleven years old. My uncle bought me a clarinet and my cousin gave me my first lessons. I want to encourage listeners to write to me with suggestions on format and content.